I invited the Activity Day Girls to my home for a Christmas storytelling party. I asked them to bring a favorite Christmas story to read. Most remembered to bring a book and they took turns sitting in the chair to read us all their favorite story. Thanks to Pinterest, I found Grinch themed party ideas that I thought would be fun for the girls to munch on. I wish I had used a little bigger heart on the Grinch cake but, come on, his heart was two sizes too small! We also had Grinch cookies, Grinch puppy chow and Grinch punch. I went to a quilt shop that is over in the east mountains and saw patterns for adorable tea towels. I ordered the pattern for holidays and planned to make them as a Christmas gift. Needless to say, it took a bit to find tea towels for each holiday, to buy the various fabrics, rick rack, etc. I've been working like made making yo yos for them and have come to realize it may be next Christmas when they are actually given as gifts. These yo-yos are for the bunny towel. There are three different color backsides of bunnies and the white is for their little cotton tail. This is going to be a big project since I'm making 4 sets of the towels. Our DAR Chapter has a Christmas luncheon today. I wanted to make an ornament for a "favor" of sorts. I thought it would be nice for everyone to have something. When fabric went on sale in July I bought what I would need for this project. 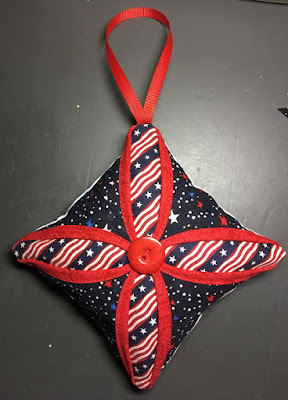 One part of me really would liked to have used Christmas fabrics but I kept in mind this is for a patriotic group and they can hang it off a door knob or cabinet, etc. and use it year round. I hope they like it. I tried to remember to take pictures as I went through the process. I made 64 of these ornaments in an assembly line sort of way in that I did each step for all of them and then moved on to the next step. The Main Fabric is 10" x10"
Center fabric (lower right) is 5" x 5"
Accent fabric measures 4.5" x 4.5"
We had a Christmas open house. It was nice to sit and visit with friends and enjoy the beginnings of the Christmas season with them. We had fondue pots with oil to cook beef and chicken. We had sausage been dip, spinach dip, cranberry meatballs, Asian meatballs. A cheese fondue to dip bread and vegetables in and a chocolate fondue to dip fruit, marshmallows and cake in. There were cookies and fudge, too. The picture reminds me we also had a Mexican layer dip. It would be hard to leave this house hungry.